These are the longest nights of the year, which is good news for nocturnal animals like the black widow spider, which prefers to slink around in the darkness, hiding in obscure places like inside pipes and under porches. “Black widows start coming out around twilight when it’s not completely dark,” said Rick Vetter, a retired scientist at UC Riverside who has studied the spider for 40 years. That’s when they start to build their tangled webs, he said, which they’ll live in their whole lives. We’ve all heard the stories. She mates and then kills. Her venom is 15 times stronger than a rattlesnake’s. One bite could kill you. With a shiny black color and a glaring red hourglass stomach, she has long inspired fear and awe. But it turns out, scientists say, much of that is overblown. “I think the black widow’s reputation is totally undeserved,” said Catherine Scott, an arachnologist at the University of Toronto who has researched black widows for years. Most species of widow spider (there are 31), including the western black widow found in the U.S., don’t kill their mates at all. Only two widow spider species always eat their mate -- the Australian redback and the brown widow, an invasive species in California. And the male seems to be asking for it. In both of these species, he offers himself to her, somersaulting into her mouth after copulation. If the western black widow does eat the male, Scott said, it’s because she mistakes him for food. “If the male enters the female’s web and she’s really hungry, she might be more interested in her next meal than mating,” Scott said. Scott is conducting a research project to illuminate the antics of the male black widow, the neglected character in the mating drama. It turns out the males are far from innocent bystanders, according to Scott. During peak mating season, thousands of males will prowl around looking for females. Females set up their webs, stay put and wait. Female black widows use pheromone-laced silk to attract males. “Kind of like a chemical personal ad,” Scott said. The male can detect this scent from 200 feet away, a long distance when you’re the size of a grain of rice. The scent tells the whole story of her mating history and even includes her hunger level. The strange thing is that female black widows seem to like it. In her research, Scott has found that females are less aggressive and become receptive to mating sooner when males tear down their webs. By taking down their silk, male black widows may even be doing females a favor, Scott said. As long as her pheromone-laden silk is around her, she will continue attracting males, as much as 40 each night, even if she’s done mating. By tearing down her silk and masking the scent, the male is giving her the opportunity to rebuild her web with some new neutral silk. It’s like he’s helping her remodel. Scott suspects that there are some chemicals in the male’s silk that are attractive to females. While mating, he will wrap her in fine strands that researchers refer to as the bridal veil. He drapes his silk over her legs, where her smell receptors are most concentrated. After all that, he is most likely to crawl away, alive and unscathed. What about that deadly bite, supposedly so fatal to humans? While many people report black widow spider bites every year, only a fraction result in serious symptoms, and almost none result in death. Biting is the widow’s last defensive recourse, like if she’s about to be squished by a looming human foot. 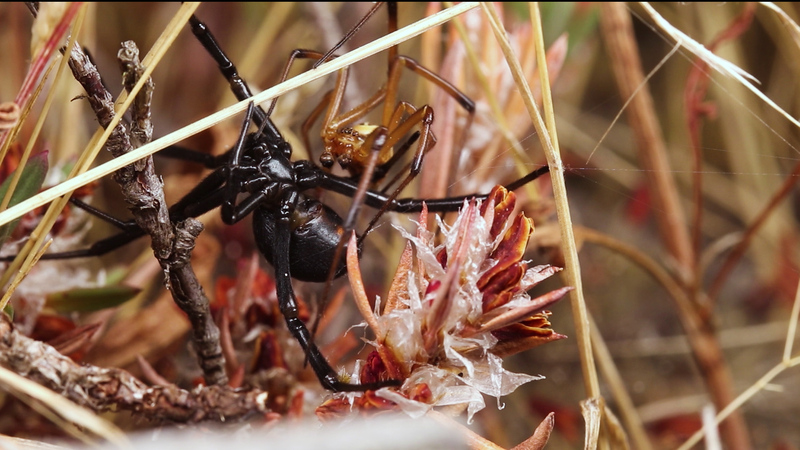 In his work, Vetter pioneered research into the female black widow’s defensive behavior, illuminating how, when confronted, she will stretch a special type of silk between her two back legs and brandish it at an attacker. “The silk looks like fishing line covered in droplets of glue,” said Vetter. This silk is extremely unpleasant to the curious -- it can get stuck to their nose. As the tangled predator tries to free itself, the widow has a chance to run. 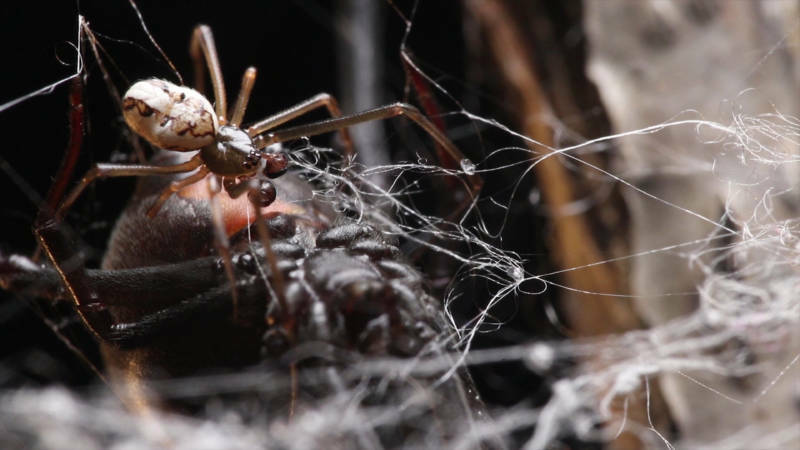 Scott said the biggest misconception about black widows is that they’re so­­mething to fear.